Heinkel Cars have a cargo net on the right side of the interior. 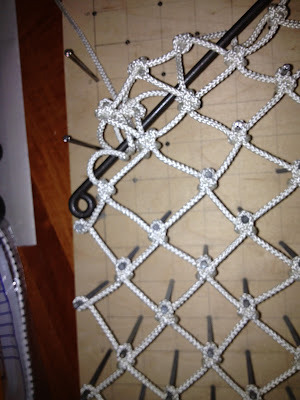 The net is a hand stitched macramé marvel. An often-cited statistic is that Heinkel lost money on each car they produced; it’s hardly surprising when you try to fix or re-weave the net by hand. It is a time consuming and confusing process. 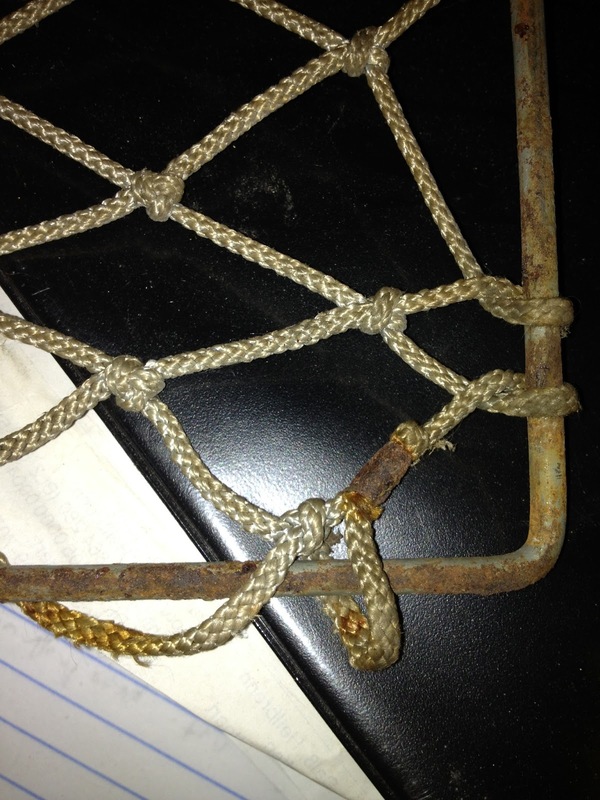 Here's a closeup of the original net, where some of the repair issues are apparent. The net was woven around a metal frame. Like everything else on a 50 year old car, the net frame was rusty and really needed to be painted. In the two places where the net comes together, the ropes were attached with a metal clamp, which was also corroded. The net is an important interior feature of the car. It helps complete the interior appearance and is charming in its own way. The Heinkel Club of Germany had some directions on how to re-weave the net. In the Club’s Download area (members only) you can find an article entitled “Restaurationsanleitung für das Netz an der rechten Innenverkleidung der Kabine” by Cornelia Koster. It is well illustrated, with detailed diagrams on how to tie the knots. After skimming this article I decided that the net was beyond my skills and temperament. My options were to send it out or see if I could convince someone in my family to try. Luckily I have very talented family members, and my daughter volunteered to give it a shot. The first step was to translate the article from German into English. I cut and pasted the whole article into Google Translate a piece at a time, and eventually I had a passable translation of the task at hand. 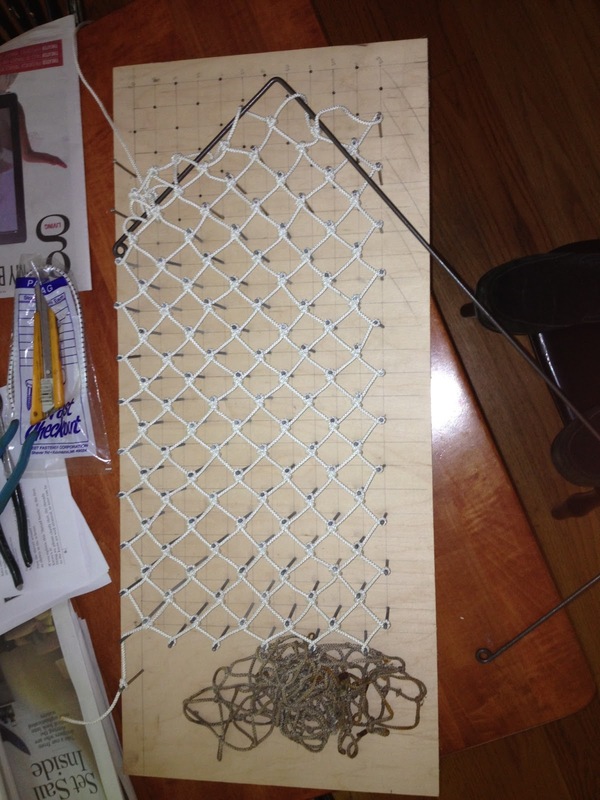 In order to weave the net you need to build a loom and shuttle system. I took a piece of ¾” thick (19mm) plywood and drew an intersecting grid. Into the grid I nailed a series of 3” long (10d) finish nails. 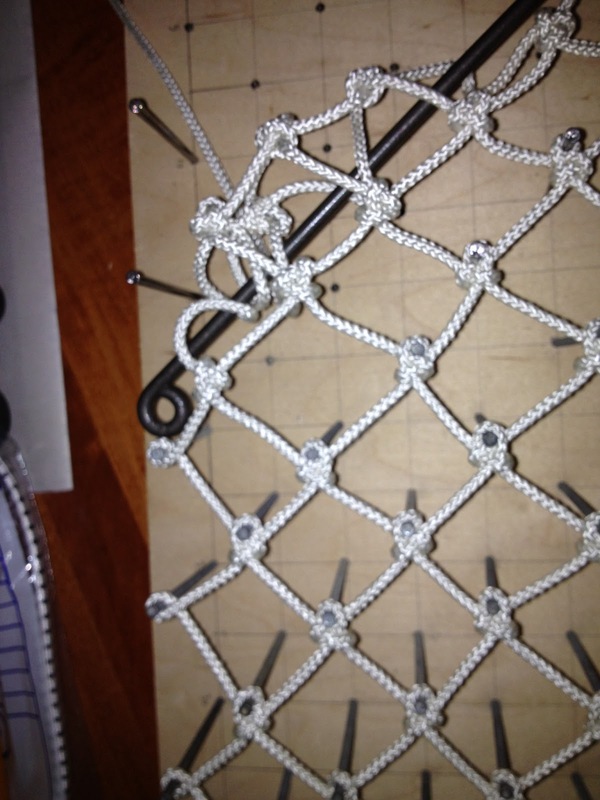 These would act as the posts around which to tie the knots. I never realized nails could be so dirty! I had to polish 1.5 pounds of nails before I could hammer them into the board. Once the loom is built you will be ready to weave one continuous piece of string around the nails in a predefined pattern, tying them at each nail. I used about 250 feet of 1/8" polyester cord from TW Evans. Once you weave the string and crimp the ends, you weave the metal frame into the net and crimp the two loose ends to an adjacent piece of the netting. 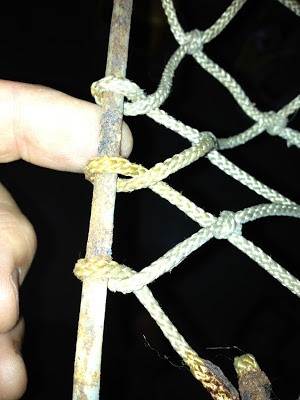 The final step in completing the net is to get a piece of ¼” stretch cord and string it across the opening in the frame. This gives the net capability to secure items.